Figure 1. The three pane window used for the quantitative tests with the photographic exposure meter. The improvement with UltraVue is easily apparent, but hardly overwhelming. Primarily this page is for me to keep track of my own measurements. It is not really intended as a public review of this material, but it may be of interest to like-minded consumers who would prefer to see a quantitative assessment rather then 'good', 'better', 'best' marketing descriptions. Insect screens on windows irritate me and I keep taking them down because I would prefer insects in the house than to spoil the view. Since Kimberly is appalled by having anything in the house with more legs than her and keeps putting the screens back up, I decided to buy some high-end screen material and see if it really is any better. The material I chose is Phifer UltraVue which though not the most expensive available is several times the price of the basic screen. The screens that I am replacing are over windows and most measurements herein have the windows closed, so include absorption by the glass. I have no idea what material was in our old screens. It is some sort of fairly heavy charcoal grey fibreglass screen. I am assuming it is "standard builders' grade" material, though the previous owners of our house did tend to install well above average quality fittings, so I seriously doubt it is the cheapest you can get. The easiest thing to measure is simply the total amount of light getting through. Subjective tests of 'how nice the view looks' are much more difficult. For this test I used a three pane window. One pane had no screen, just the glass, one screen had the old screen and the final pane has the new screen. Measurements were obtained using my camera exposure meter set on 'spot' so that I could target precisely the same location through each pane. Cameras used were Nikon D7000 and Nikon F100. (I also have a Sekonic handheld meter I may try later.) Aperture and focus were fixed for all measurements and I take the metred exposure time to give the relative throughput of each pane. Twenty measurements were taken in varying conditions and of various targets ranging from clean snow to black tarmac. I used close-up macro photos of the two screens to show that this is fully explained purely by the fact that the threads are finer on the UltraVue, they simply block less window area. Photographs of a couple of square centimetres of each fabric were taken at the same reproduction ratio. The images were analyzed by thresholding at the midpoint of the pixel values and counting the relative numbers of pixels above and below the threshold. The results were almost exactly the same as the throughput test above. Figure 2. Measuring the cross section of the two screens. Panels (a) and (c) are close-up images of the two screens at the same scale. 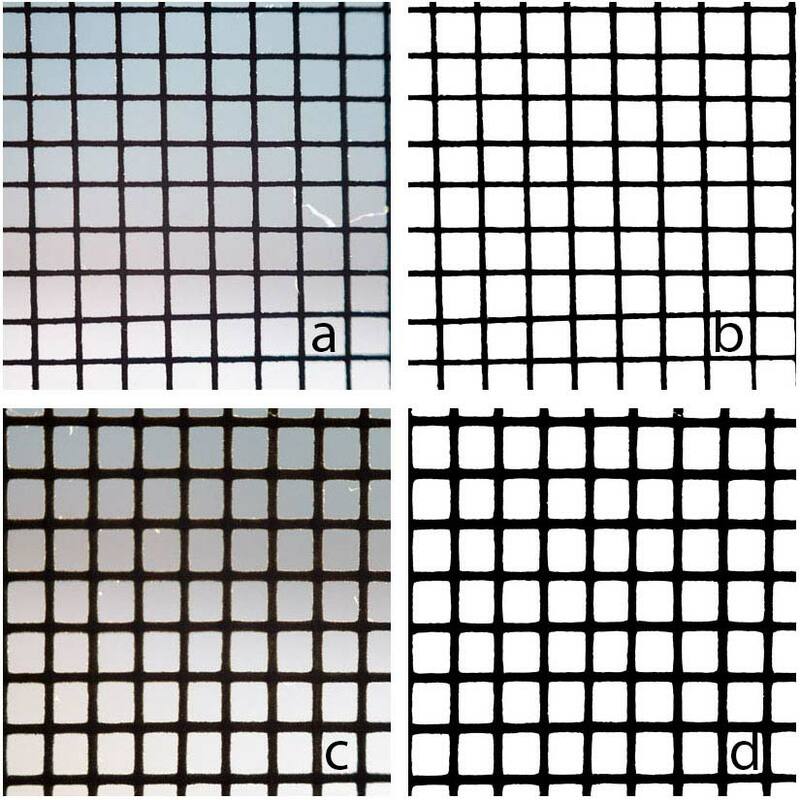 Panels (b) and (d) are the same images simply thresholded at the median pixel value to classify each pixel as either screen or clear. Top two panels are Phifer UltraVue. Bottom two panels are unidentified existing screen. For the UltraVue and old screen, the black pixels cover 25% and 35% of the image respectively. Another potentially interesting test may be to measure image resolving power through the screen material. Besides being more complicated to set up such a test I suspect the results would be highly dependent on the specific distance chosen from camera to screen and from screen to test target so I have not even attempted this yet. As a real world test, I suspect simple visual perceptions through the screen is more important. When first installed, my impression was that the UltraVue was definitely better by hardly life changing or "virtually invisible". Over time I have come to appreciate it more and I think it is comfortably better, but only incrementally. For me it was worth the extra cost, but it is certainly never going to fool me into thinking I do not have screens up. Figure 3. 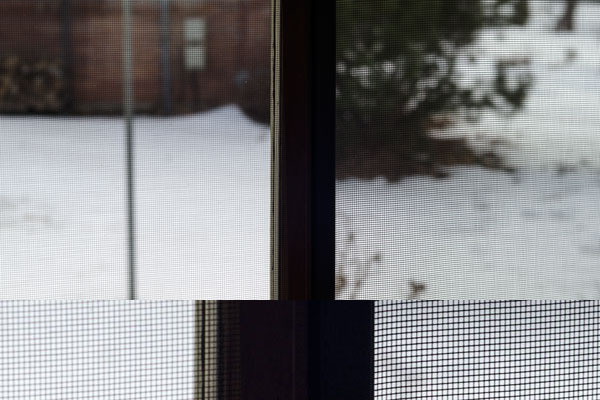 Similar to figure 1, but taken from slightly closer and with the camera focused on the screen itself rather than the view through the window. UltraVue on left and old screen on right. This image is arguably not terribly informative since the perception of screen visibility is heavily influenced by the software algorithms in reducing the image size for display on a web page. For example the moire pattern on the right hand side is mostly a software artifact. The lower part of the image is a zoom on the image centre to better represent how the screen looks in the original full size image. As demonstrated, the main difference just seems to be use of finer threads. That means that when standing up close the window you still see the screen just as much as the old screen. The difference comes as you stand back. The thinner threads simply mean they fall below the threshold of naked eye resolution sooner. To my eye, somewhere around 10–12 feet the UltraVue becomes an unresolved neutral density filter whereas I can still just about resolve the netting threads on the old screen. I like the black fabric because the windows look much blacker at night. In fact at night it is almost possible to believe there are no screens up. By careful arrangement of lighting it easy to take photo that makes the UltraView look amazing in comparison to the old screen. If I were trying to sell you this material I would obviously use images like Figure 4 where the UltraVue really does appear almost invisible. This is not the normal case, however in all cases the UltraVue looks equal to or better than the old screen. I have never managed to take a picture that makes the old screen look better. Figure 4. With care it is certainly possible to take pictures that make the UltraVue appear to be completely invisible. This photo-composite is a merge of two photographs. Top half is focused on the view beyond the screens and bottom half is focussed directly on the screens themselves. This image greatly exaggerates the apparent clarity of UltraVue through careful arrangement of lighting and camera, but it should be noted that the opposite effect was never achieved. No lightling made the old screen look better. The worst case for the UltraVue is direct bright sunlight glinting off the shiny black fabric. This may only be worse in my test because my UltraVue is brand new and the old fabric is just dull with age. 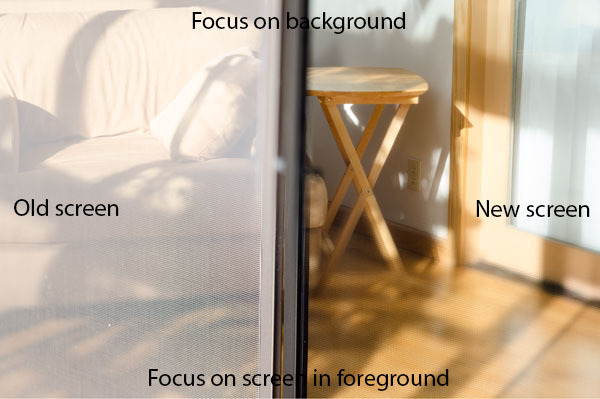 The same effect can occur with either front lit specular reflections as illustrated in Figure 5 or forward scattering when the screen is backlit (i.e, when you are inside the house looking out). Either way the screen can become highly apparent and not the slightest bit 'invisible'. That said, even with the bright glinting reflections, the view through the screen is arguably still a lot better. Figure 5. The worst case scenario deliberately trying to make the UltraVue look as bad as possible. This photo-composite is a merge of two photographs. 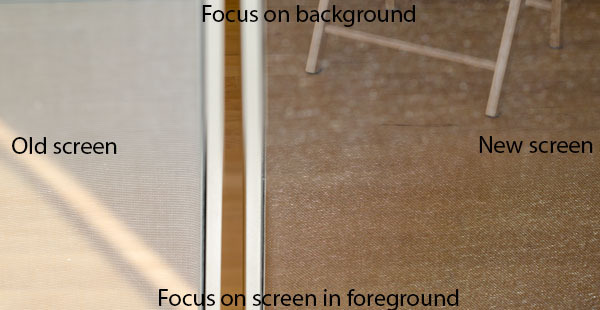 Top half is focused on the view beyond the screens and bottom half is focussed directly on the screens themselves. In most circumstances I think the improvement is fairly slight but to me personally it is well worth the extra expense. 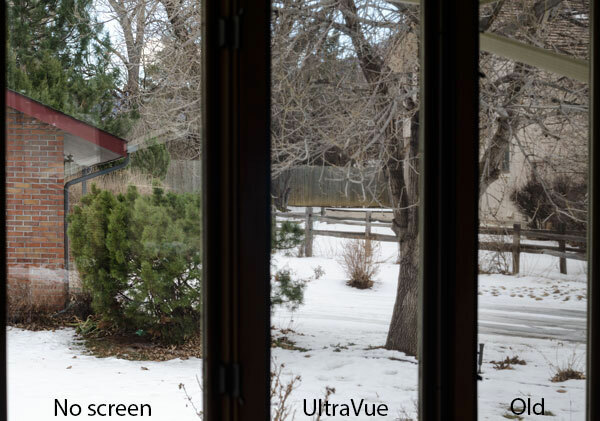 Perception of the view and how sensitive you are to see the grid of the fabric is a personal thing, but I can at least say that UltraVue is letting about 15% more light into the house than were my old screens.